Pro-Arab hackers hit website in memory of Israeli artist Eliyahu Gat, write "Death to Israel". A website in memory of Israeli artist Eliyahu Gat was attacked by pro-Arab hackers on Monday. The hackers replaced the site’s homepage with anti-Israeli proclamations, as well as the words “Death to Israel”. Gat’s family discovered the hacking attack on Monday morning, and computer technicians began working on restoring the site. Eliyahu Gat was one of the leading Israeli artists in the twentieth century and served as chairman of the Painters and Sculptors Association. His paintings have been displayed in museums around the country as well as in the Israeli Supreme Court. Gat was among the founders of the Group of Ten Israeli artists and his works were displayed in Europe. In 1978 he won the Dizengoff Prize for Painting and Sculpture, which is awarded annually by the Tel Aviv-Yafo Municipality. He passed away in 1987. The website which was hacked is part of a series of commemorative activities being carried out these days by Gat’s family. It has attracted much interest from the Israeli public. Cyber attacks have been on the increase in recent months, after hackers exposed Israelis' credit card details, and several Israeli websites were broken into. 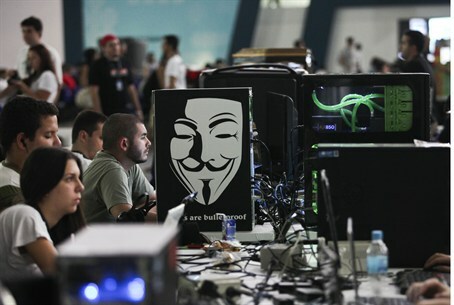 Internet security expert Isaac Ben-Israel recently said in a report on cyber security that Israel is the focus of tens of thousands of cyber attacks per week. According to Ben-Israel's calculations, Israel is hit with 1,000 cyber-attacks every minute, which he divides into a hierarchy of threats. Earlier this year, the Israeli Defense Ministry established a special cyber warfare administration, which coordinates the efforts of security agencies and the Israeli defense industry in developing advanced systems to deal with cyber warfare. The IDF’s Operations Department has recently defined the essence of IDF cyber warfare, putting together instructions that define the military's operational methods in cyber space and clarify its goals in facing potential enemies.